It's Buy A Friend A Book Day! It is buy a friend a book day! I love this day! Today I will purchase a book for a friend from The Book Depository because the shipping is free and I can send that book directly to a friend! This is the third year I will participate and I really think this should be a recognized day! You can and should purchase from a local small independent book store of course when ever possible but the friend I have in mind lives very far from me and well shipping where I live is twice the cost of the book! 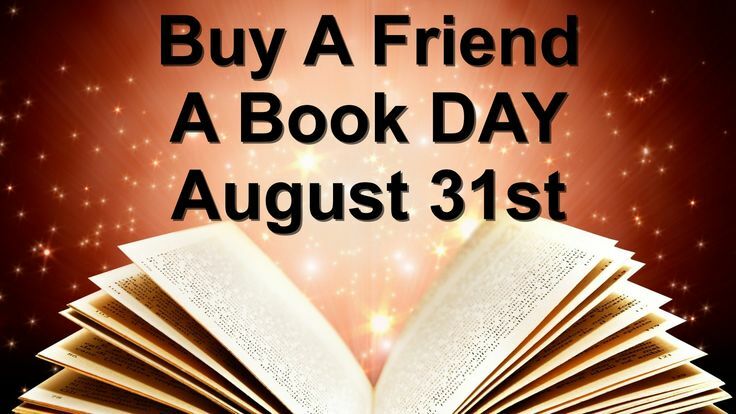 It doesn't have to be an expensive book and it can be for anyone you consider a friend! I think this is such a fun way to celebrate the love of reading and share that love with someone who's friendship you value! 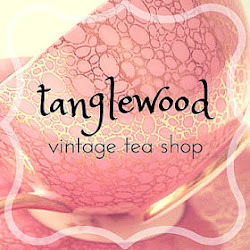 So right after tea I will place my order for my friend and can not wait to hear what she thinks of it! I hope you will join me in this fun not yet official day! If you would like to purchase a book for a friend and have it shipped to them for free click here to shop at The Book Depository! 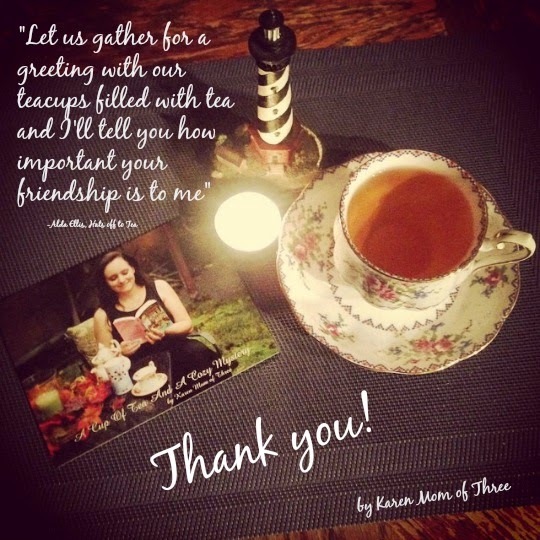 Thank you for joining me for this cup of tea and buy a friend a book day post! This is one of my most requested coffee cake recipes. It is easy and not too sweet. It is a great breakfast or coffee cake. It is moist and the perfect way to welcome the Pumpkin Everything Season. In a medium sized mixing bowl beat the eggs, oil and sugars, add the flour, baking powder and soda, spices and salt. Pour into a prepared (sprayed with non stick spray) 9X13 inch pan and bake at 350 degrees for 40 mins until a cake tester (or tooth pick) inserted in the center of the cake comes out clean. Good morning from the Wet West Coast of British Columbia! It has been months since I was able to type those words! The rains have returned with vengeance and I have missed them so! We have had so little rain in the last few months that I welcome the soggy weather that is currently flooding my cracked and dry land. It is perfect for baking and that has just been what I am doing. 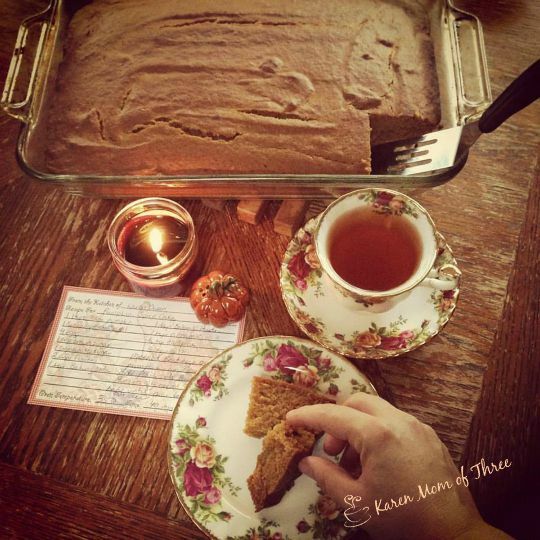 I promise this recipe for my Pumpkin and Spice Coffee Cake will publish tomorrow here on my blog that photo is a teaser! This has been a very productive reading week for me and I think a record. I have read three books this week and I am still amazed at that ! 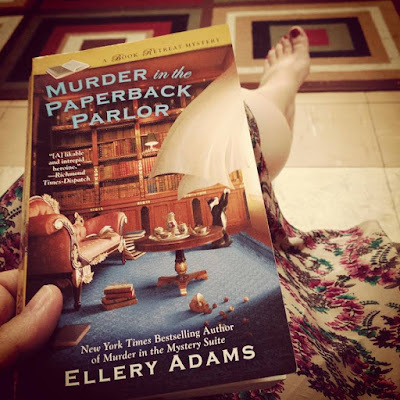 My long awaited copy of Murder in The Paperback Parlor by Ellery Adams arrived with my other pre order a new cozy series from Kathleen Bridge. I really enjoyed both of these cozies and was thrilled to have them arrive from The Book Depository. One of my readers asked me this week how I get my books for free. The truth is I purchase most of my books. I do this through The Book Depository and I pre order my favorite authors books usually months in advance. When I pre order a series I have not heard of before it is often because I saw the cover art on Facebook and I trust a few cozy mystery groups and rely on their suggestions as well. I do however from time to time receive Advanced reading copies or electronic copies of up coming books from Authors and I am amazed and truly grateful when this happens. How it happens I am still trying to figure that out! 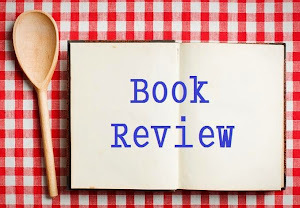 I have been blessed with feedback and communication with authors who's work I have appreciated over the years and sometimes they take a chance on me and allow me a early look at their work. For this I will be truly grateful and remain in awe of everyday. Another wonderful way I have found a few authors is through my kindle app. 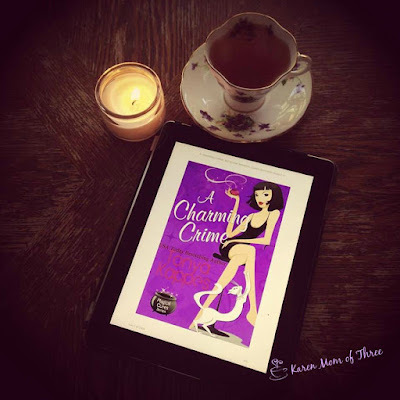 Often Free Cozy Mysteries come up and I down load them to my app, sometimes they go on sale and I purchase them for less then a trip to Starbucks and I have been pleasantly surprised at how great they truly are. I have read Tonya Kappes work before and I just finished a Charming Crime and this week it was free on Amazon Kindle! So you never know! 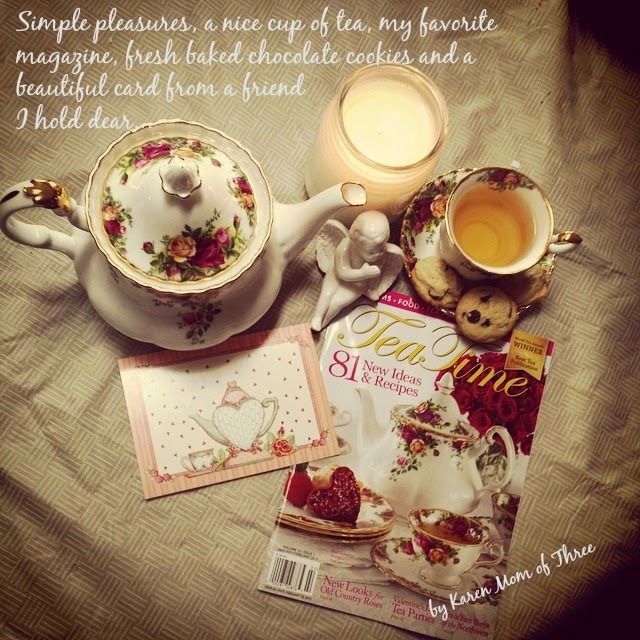 I also had one tea party this week ( I have a fun one planed for today too!) and I got to try out new recipes this week. 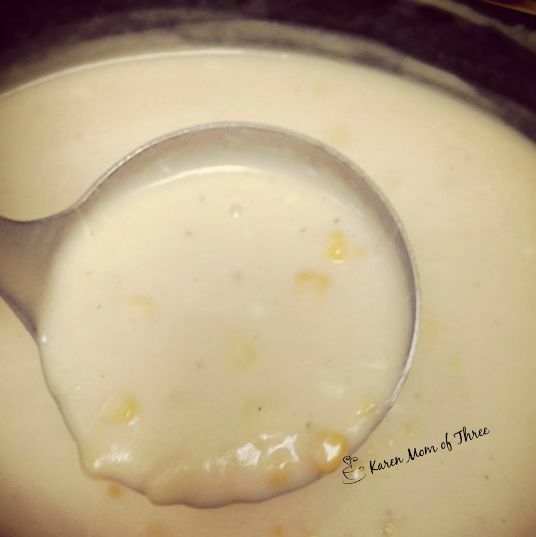 I made Potato and Corn Soup in the crock pot, which was delicious and one I will make again. 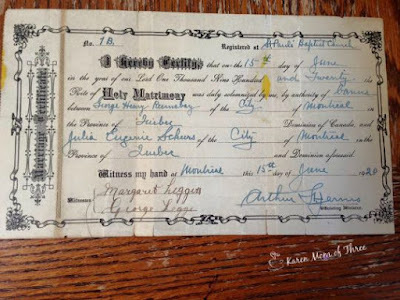 If you missed my post earlier this week I was cleaning out the garage and found two letters from World War Two written by my grandfather and found my great grandparents marriage certificate from 1920! Not sure how they ended up in my garage but very cool to have found them. This week my cousin and aunt had major surgery and I am very happy to report that things have been going very well for them, we hope that they will be out of the hospital soon and on the road to recovery. Thank you to all of you who reached out to me on Facebook and to those of you who kept them close in your heart this week. 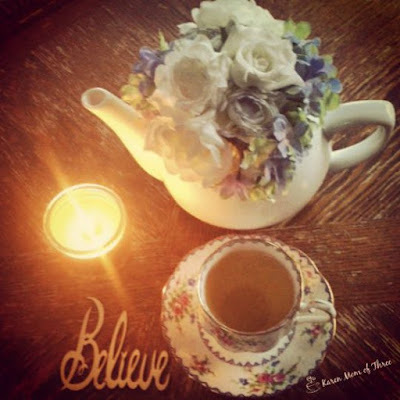 Well I have a rather large and exciting tea party I must get ready for now. 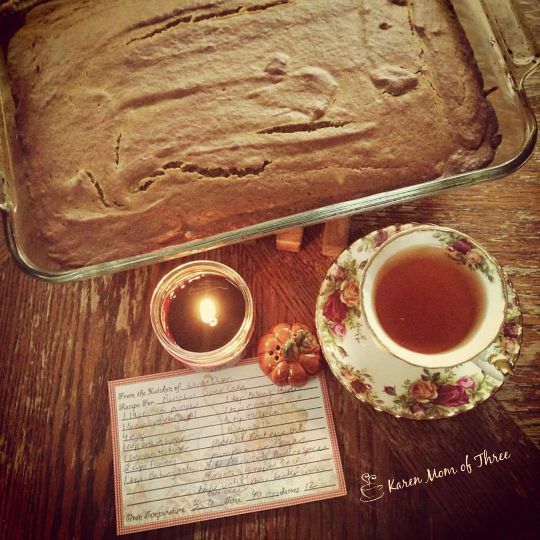 Tomorrow check back for my Pumpkin and Spice Coffee Cake Recipe! 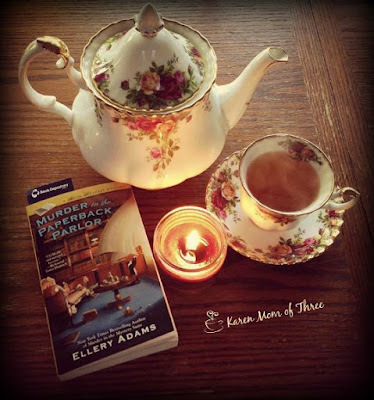 Thank you for joining me for a cup of tea and a cozy mystery this week! I have had this book for a while now on my Kindle app and at time of publishing this post it is offered free on Amazon.com's kindle page. I started this book a few days ago and found it to be an entertaining and lovely little paranormal cozy read! Thank you for joining me for A Cup of Tea and A Cozy Mystery! Nice when the Cozy is a free one to share! My Cozy Crock Pot Potato Corn Chowder A Tea Time Treat And Family Mystery! Even though it is late August, my thoughts are turning towards the hustle and bustle of the fall days just around the corner and with that brings the cozy casseroles and soups that come with sweater weather and jeans. So I set out to make for the first time soup in the Crock Pot. I wanted to try a potato soup "just to see how it turns out" in a crock pot and I was thrilled with how easy this soup was to make and that it freed up my cooking time so I could clean out the garage with my boys. Turn your crock pot on to low. Chop up your onion and add it and your chicken stock, frozen hashbrowns to the pot, add your Worcestershire sauce and cover with the lid, allow to simmer and cook for three-four hours. Use a hand blender (mine is an Oster hand blender I got at Walmart I love this thing it works very well and less mess then a regular blender) to combine the onion, potato and liquid. Add the corn, and season with salt and pepper. Cover and cook one more hour on high. 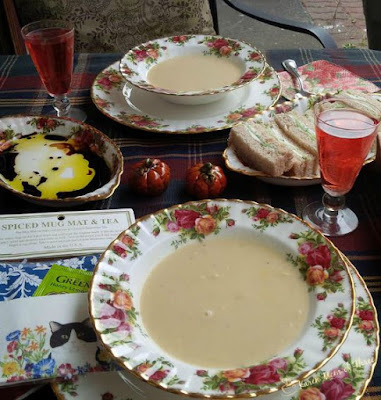 My friend Daniela came for lunch and I severed the soup with cucumber and cream cheese sandwiches and a loaf of bread I made, with a side of Olive Oil and Balsamic Vinegar! 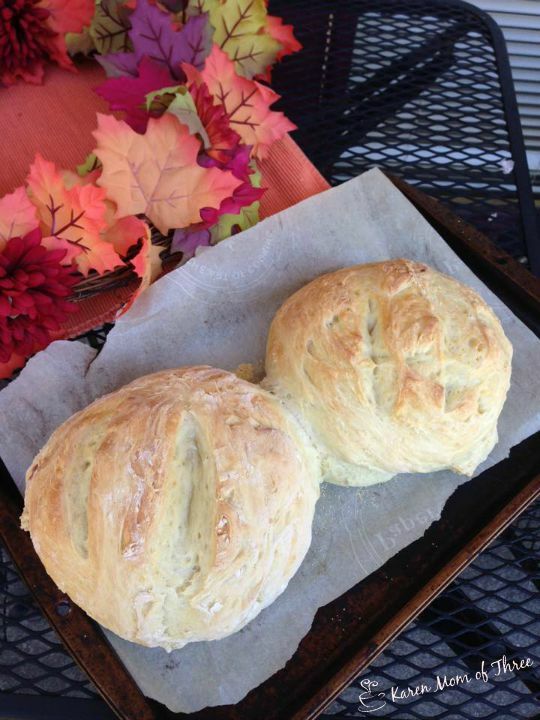 For the bread recipe please click here. I swear I am still so full! I also served the Watermelon Lime Iced tea with it. We had a lovely lunch! I gave her the spiced Mug Mat I found at Celestial Seasonings Tea Store which I knew she would love as the cat looks like my Squirrel! 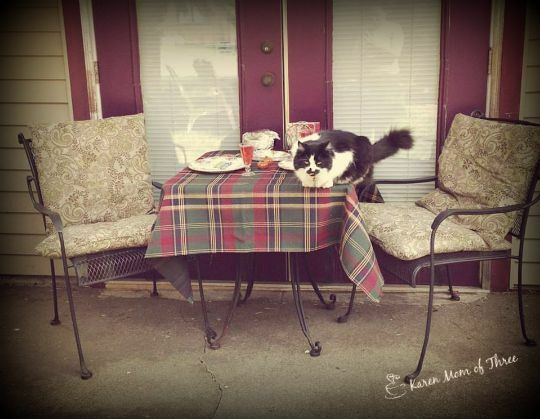 When I set the table Squirrel wanted to join in. My friend and I had a lovely lunch and time to catch up but before I forget I have to tell you about the treasures I found in my garage while cleaning it out earlier! In a very small envelope on the floor of my garage was a yellowed envelope with my grandmothers writing on it, inside were two letters my grandfather wrote to his dad in World War Two! 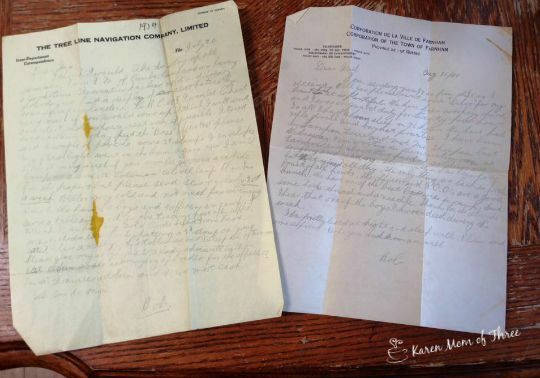 Dated 1939 and 1940! 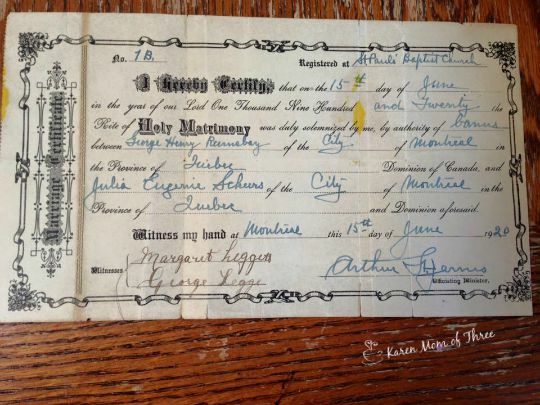 Also tucked into the envelope was my great grand parents Marriage Certificate from 1920! A pretty good find when I think about how long that has been in an envelope and how it came to be in my garage 3000 miles from Montreal and 95 years later is a huge Mystery to me. 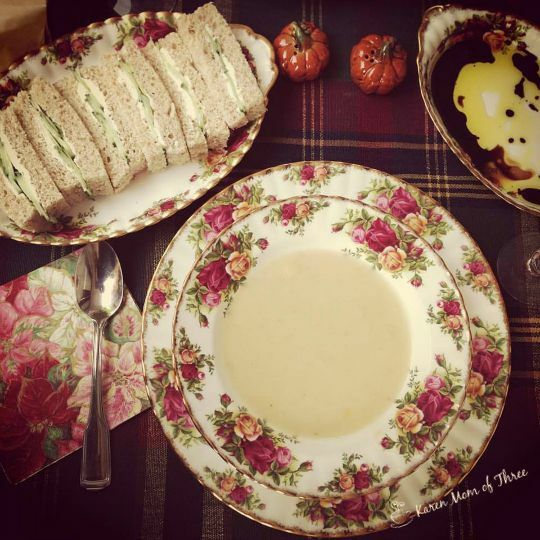 I really enjoyed the soup and a great visit with my friend. I and I have had a very productive last few days! 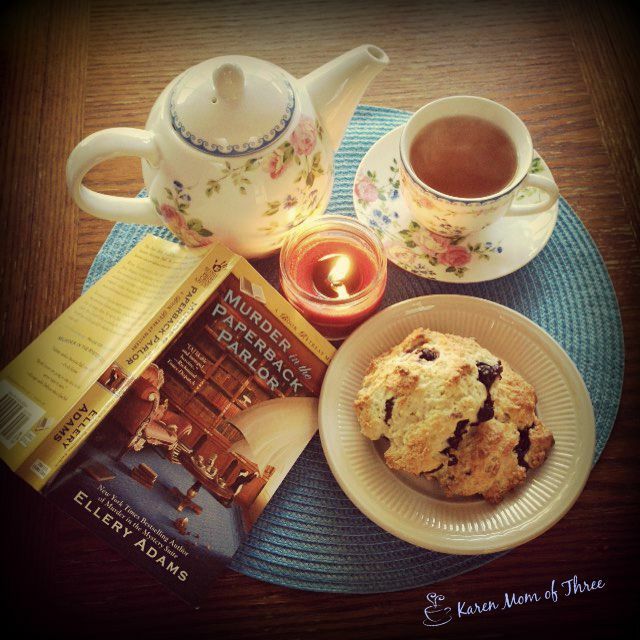 Thank you for joining me for A Cup of Tea, A Cozy Recipe and A Family Mystery! Better Homes and Corpses, I Am So Glad I Ordered This First In Series! 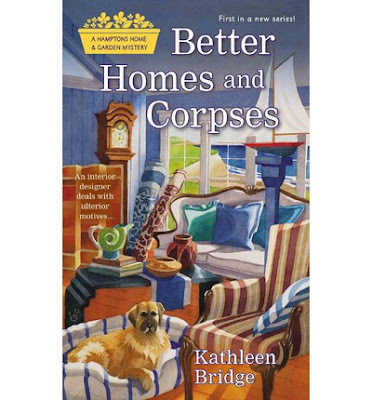 I finished Better Homes and Corpses yesterday and I am so very glad I took a chance on this first in series from Kathleeen Bridge. 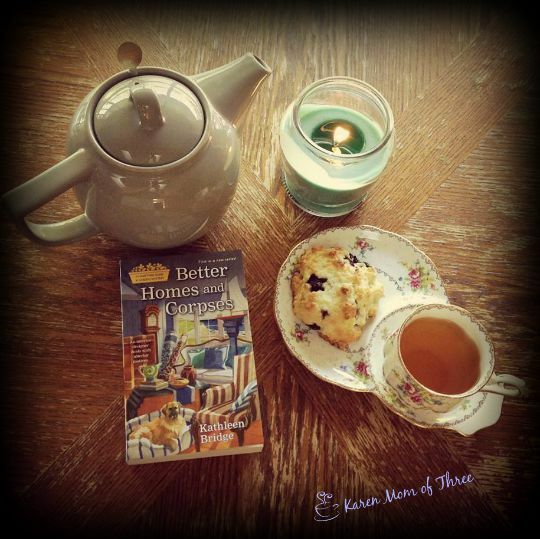 Better Homes and Corpses was such a captivating read that I read 36 of 37 chapters on the first day and left the last one and the recipes to read in the morning after I could not longer keep my eyes open! I choose this book to pre order based on the cover art I saw on Facebook and ordered it from The Book Depository a few months ago and it arrived last Friday to my delight! I enjoyed this mystery and the twists and turns that it took and I was guessing until the end. I found myself surprised when the murder was reveled and was very impressed with how the mysteries unwound. I also loved that the main character who is a classically strong female cozy mystery lead and is also the first character I have read who has a disability. This disability features in such a positive way and not a cumbersome way that it actually aides in her abilities to investigate! As a mother of two children with disabilities I was more then thrilled with this aspect of the character and the strong positive message the readers receive about what is like to live with and work with a disability. I like the idea of this character and that just because someone has a disability is doesn't have to define their every move or dictate all aspects of their life choices. Main character Meg Barrett is an amazing character who is inquisitive, smart, creative, beautiful and strong. She is not limited or defined because of the disability she has, that is one of the things that stood out most for me about her. 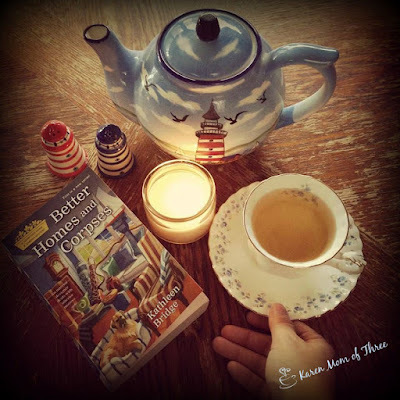 This cozy is set in the Hamptons and if this first story is any indication of how the next story will be written I believe this will be a very successful series! Oh and there is a great dog in this series I hope will stick around for many more stories yet to come! To order this wonderful book from The Book Depository like I did please click here. Thank you for joining me for A Cup of Tea and A Cozy Mystery today and I am back to stalking the mail man while I await another paper back book to read! Murder in the Paperback Parlor Is A Readers Delight! Sunday night I finished one of the best books I have ever had the pleasure of reading. 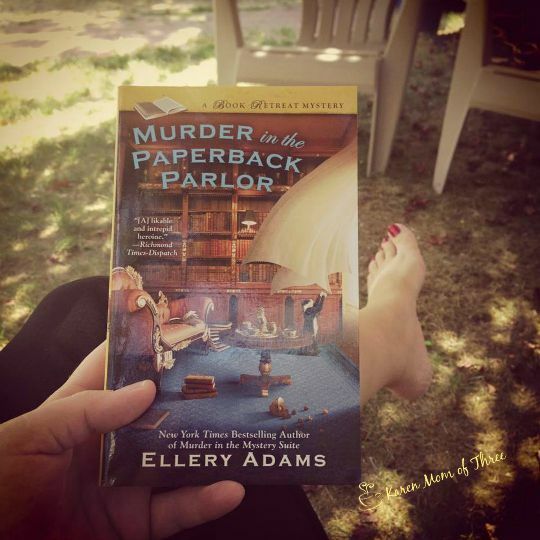 Ellery Adams Book Retreat Mystery Series book two Murder in the Paperback Parlor is extraordinary, it is one of the most action packed, adventurous mysteries that I have ever laid eyes on. If ever there was a main character to champion it is Jane! When I started my adventure out under my maple tree on Friday I had no idea what I was in for. 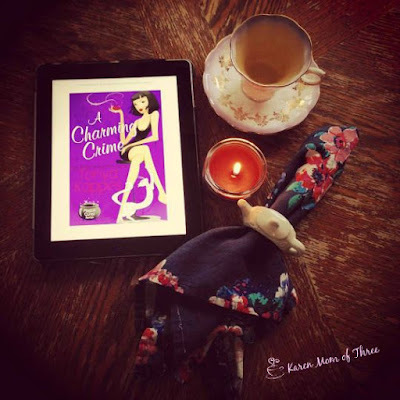 This was written so well I felt like I was at Storyton Hall for Romancing The Reader week. Ellery writes in such a way I felt like I could see, smell, taste and feel Storyton Hall for myself. I actually dreamed of the story line when I went to bed and truly felt apart of the story. You are in for a treat and this book was so worth the wait! When I pre-ordered it many months ago I had hoped this story would be as good as the first and my mind was put very much at ease as this one was even better! I ordered my copy from The Book Depository and I can not wait for book three. I hear it is out next summer and I will keep updated for pre release sales. 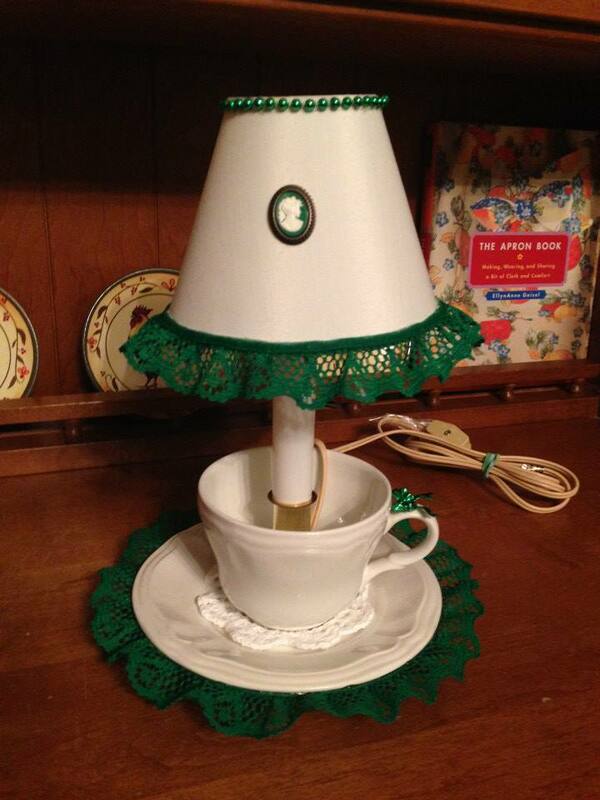 Reader Spotlight Ginny Sue Spinuzzi Fisher And Her Tea Time Inspired Crafts! 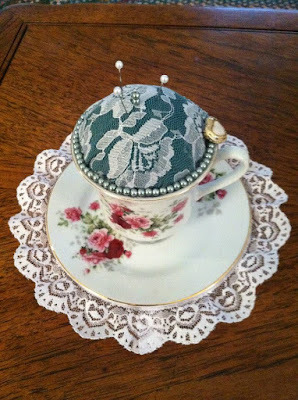 Today I wanted to share one of my wonderful readers new ventures and her fantastic tea time inspired crafts. 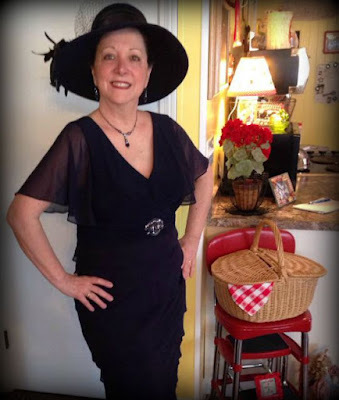 Ginny Sue Spinuzzi Fisher has kindly allowed me to share a bit about herself and her work today with all of you! I hope you will welcome her and enjoy her crafts! Ginny makes lovely teacup lamps and pin cushions and has recently started to sell her crafts locally! I was taken aback by how charming these crafts were and they have me scrambling to find a spot to put one! "I'm a big coffee and tea drinker. My husband tells me I have a little bit of coffee with my cream and sugar. Coffee in the morning and then tea in the afternoon and evening. " "I've always loved doing crafts but since retiring five years ago, I finally have time to learn how to do different things. My big one right now is learning to sew/quilt. 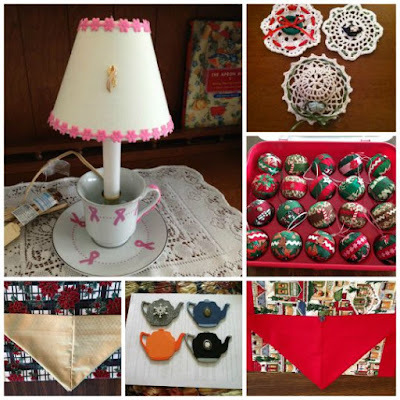 I have always loved anything homemade, vintage and with a history. So I hope that some of my homemade items will be passed on in families with good memories. Right now my favorite things to make are seasonal table runners, quilted ornaments and of course the teacup accent lamps." 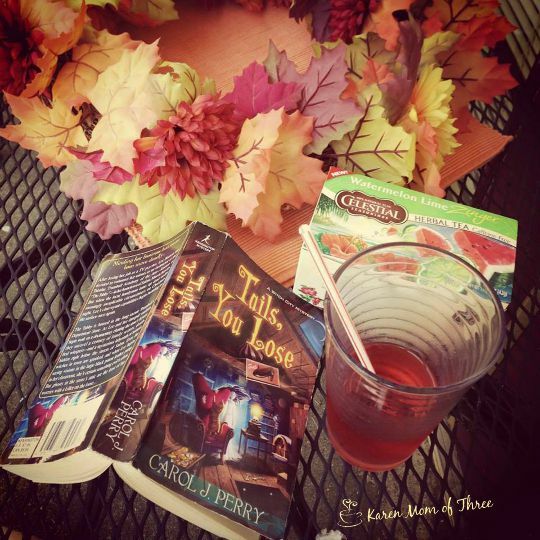 Do you have a favorite Cozy Author?
. 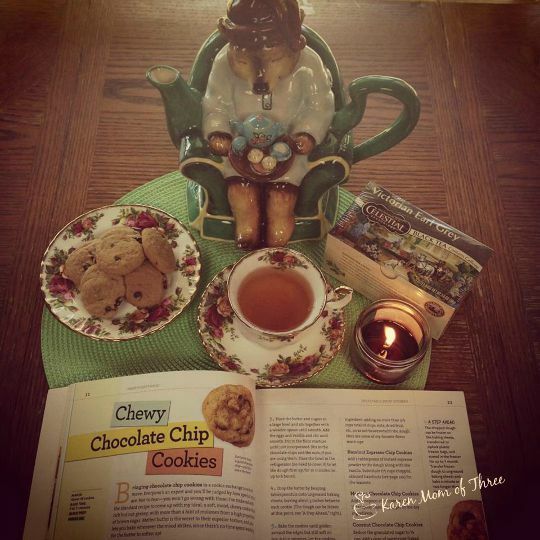 "Oh my favorite cozy authors are Laura Childs and Melanie O'Hara Salyers. 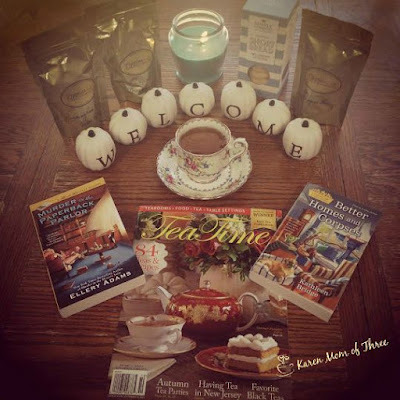 Love the Tea Shop Mysteries of Laura's and Melanie's series of The Traveling Tea Ladies and her new series Savannh Skies. You truly feel like the characters are your friends." Tell us a bit about your family! "I'm sure you have gathered by now I come from a big Italian family. I have 3 sons and 1 daughter of my own and 2 step sons that are mine! We were just blessed with our 25th grandchild and #26 is due in December. We both retired from the state of CA back in Sept 2010 and moved to my husband's home town in northeast Ohio. 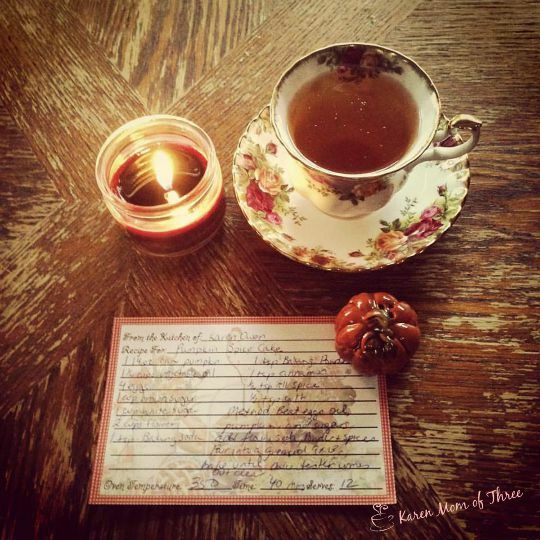 I love the slower pace and the seasons." 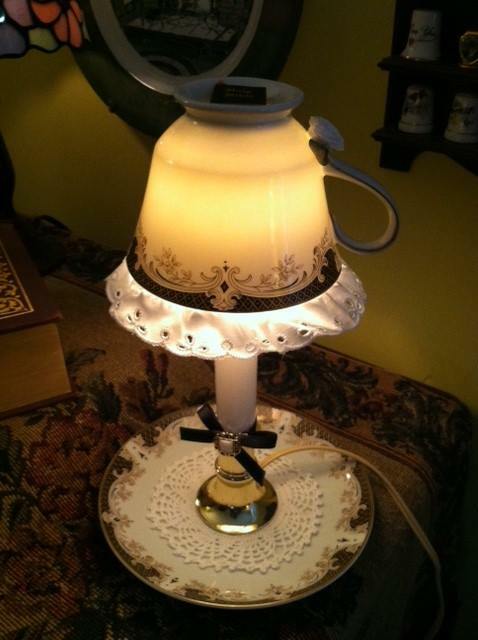 You can find Ginny's Tealightful Treasures And More on Facebook by clicking here. 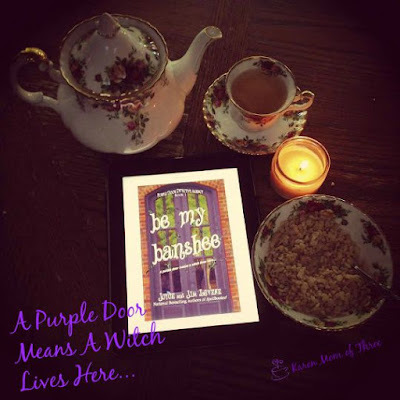 Coming This September Be My Banshee A Purple Door Detective Agency Mystery You Are Going To Love! I was thrilled to be sent an advanced reading copy of Be My Banshee by Joyce and Jim Lavene. I could not put it down and found it to be a really fun, action packed mystery full of paranormal characters you will love and root for! I had no problem visualizing the story and characters in my head, I think this book would make a fantastic Syfy Channel Series! I love the idea behind the Purple Door Detective Agency and the idea of Witches, Banshees and other Mythical and Paranormal characters working together. I truly enjoyed this story and even had my Ipad battery die while I was reading it. Picture me trying to finish reading this way past my bedtime on a child's chair one foot from the plug while my ipad charged to 8% so I could finish reading the book before bed! 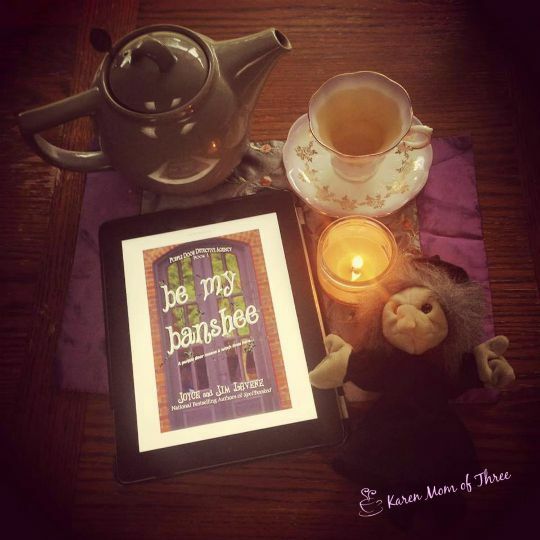 If you are looking for a new paranormal series this fall I recommend Be My Banshee, you can order it for your Kindle or your Kindle App by clicking here. 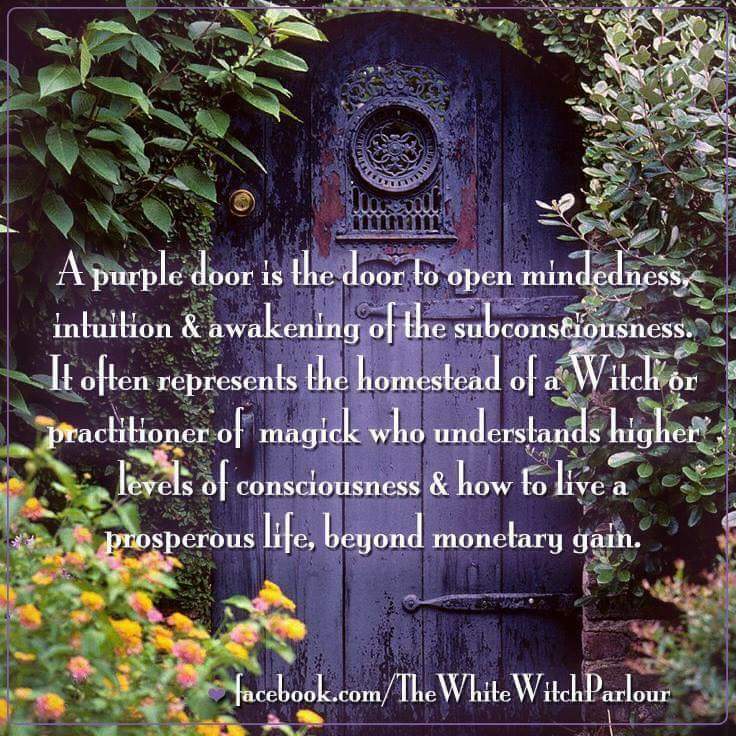 I loved this meme from Facebook and that my own door is painted purple as well! I read, reviewed and enjoyed Tails. 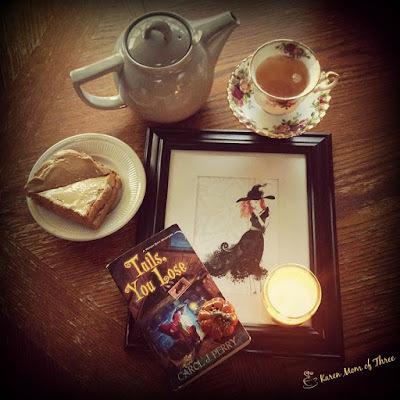 You Loose this week by Carol J. Perry and was thrilled to be able to use my framed Halloween Card from Last year. I found it at Walmart and it is such a pretty card, I bought it for myself and put it in a frame. I can not wait to see if this artist puts out a new card for this year! 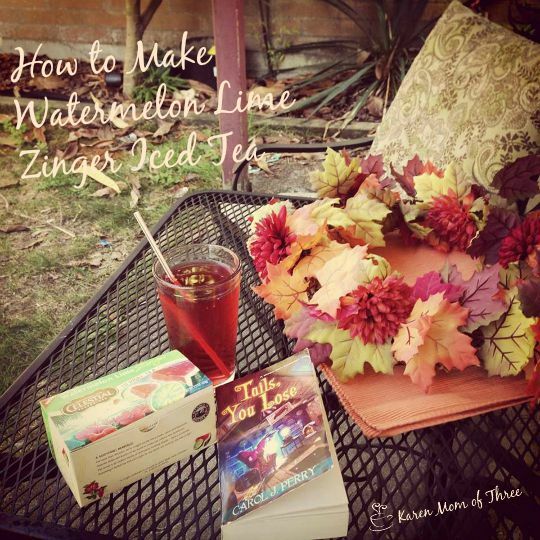 Yesterday I shared my Watermelon Lime Zinger Iced Tea Tutorial....I am on my second 20 bag box from Celestial Seasonings, I really love this iced tea! Its not bad hot either, caffeine free, natural and delightful! I also read Be My Banshee a new series for September from Joyce and Jim Lavene. I highly recommend it if you are looking for and enjoy paranormal mysteries. These authors have a winning combination of characters with this story and I can not wait to see what they come up with next. I have enjoyed quite a few cups of new tea this week, Trader Joe's Earl Grey is a really good bagged tea. 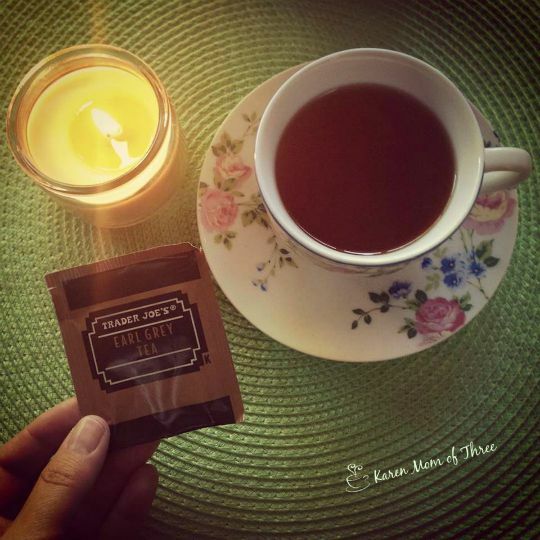 I have also been enjoying Celestial Seasonings Tension tamer which I added to my last batch of iced tea and it was a nice addition. 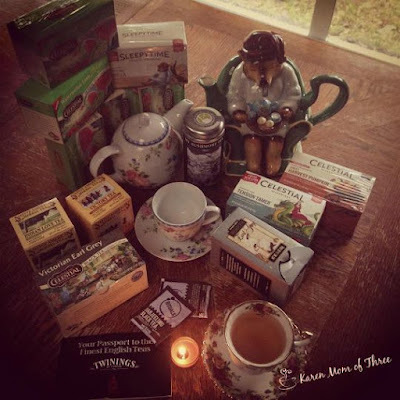 I also had the Victorian Earl Grey by Celestial Seasonings which was not bad but not soon to become a favorite of mine. 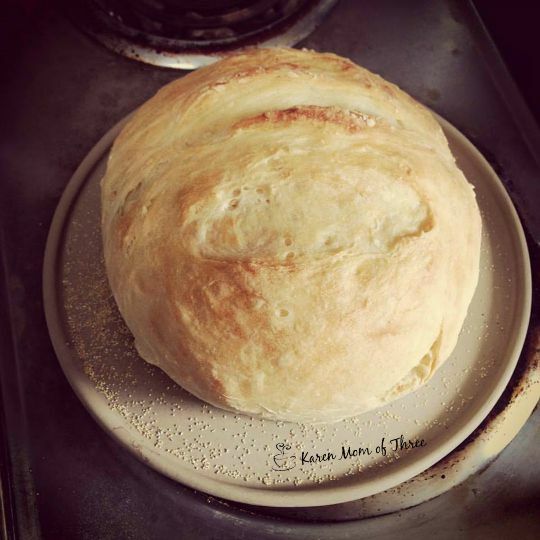 this bread is fantastic and I know I will be making it again soon. 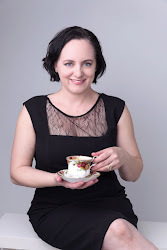 No tea parties this last week but I have a special on planned for next week I am excited to share with you all soon. I updated the Facebook page with an Autumn inspired banner and reminder of the up coming Buy A Friend A Book Day! I love this event and hope you will find away to participate in your own way. 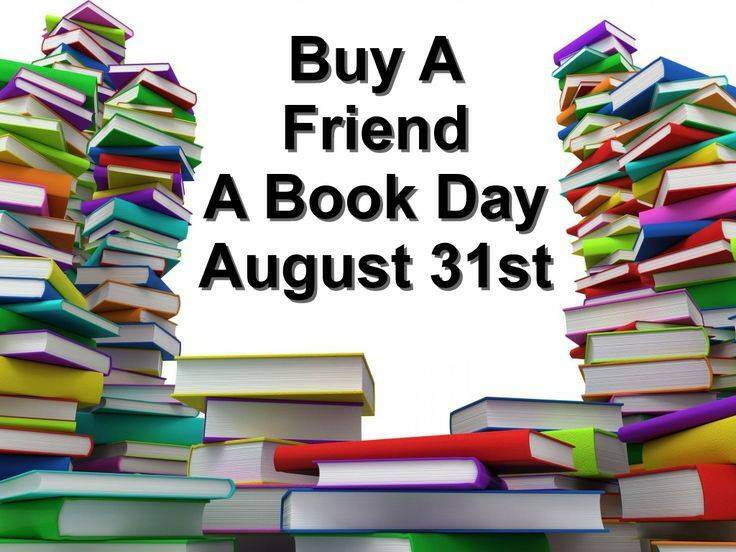 It is simple you just buy a book and give it to a friend. 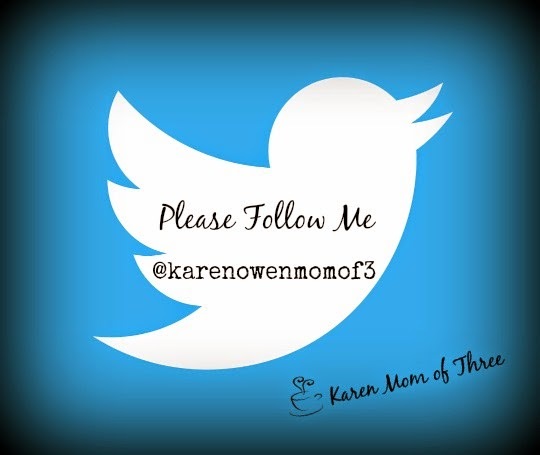 This is a fun one to do and I can not wait to share a few books with a few friends as well! As I live in Canada when I send the book out to my friends it can take up to two weeks to get to them in the USA or even here in Canada so the fun get's extended! I make sure to buy the book on the 31st and send it that day! Using The Book Depository is an easy way to participate because there is not cost for shipping and I can direct ship to my friend. That is my week in review and I look forward to sharing my review of Be My Banshee Tomorrow! How Make Watermelon Lime Zinger Iced Tea Like I Have Been Enjoying! When I was at the Celestial Seasoning Factory in Boulder Colorado a few weeks ago I got to do lots of taste testing and my favorite of their iced teas was their Watermelon Lime Zinger tea. I asked the lady offering the samples just how she made it and now I am going to share that with you. In the Celestial Seasonings Tea Shop I purchased 6 boxes of the tea and now I am wishing I bought more! 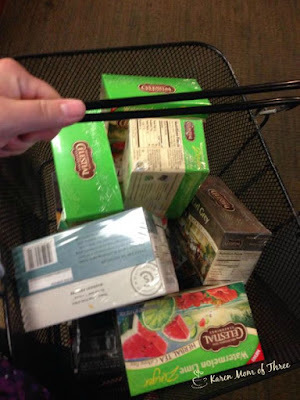 There are 20 tea bags in each box and the price for the box you can make this tea for pennies a glass! I am truly hopeful that my grocery store here in Canada carries this blend and if not I will be placing a large order soon I am sure! I am a big fan of the Passion Tea lemonade at Starbucks and my son Alex and I have stopped their often this summer to share a Venti sized drink ( I get mine with 1/2 the sweetness), which doesn't last long. 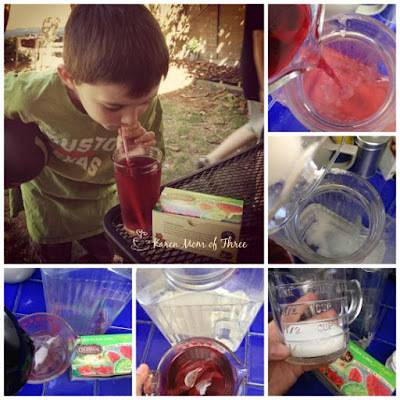 Making this tea which I think tastes even better is not only going to save us money but has opened our eyes to making a great quality tea at home without adding Lemonade or Juice! I am going to make and include this tea in his lunch box for school and feel great about doing it as I control the sugar! I also loved the assurances I got during my tour of the Celestial Seasonings Tour that they use natural indigence and as a bonus Celestial Seasonings Makes their teabags with out strings and staples in a natural fiber tea bag that saves 3.5 million pounds of waste a year out of landfills! Step 1-Put 2 cups of water on to boil in either your electric kettle or on the stove. In a 2 cup measuring cup place 4 tea bags. 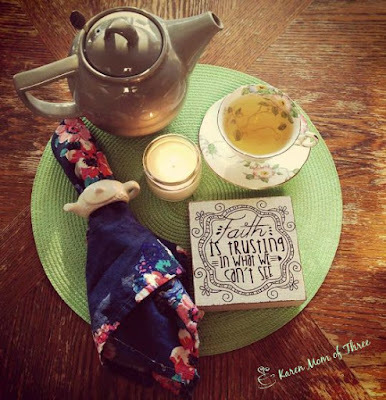 Step 2- Pour the boiling water over your teabags and allow your tea to steep 4-6 minutes. Step 3- Measure out your sweetener if desired. Add it to your juice container. 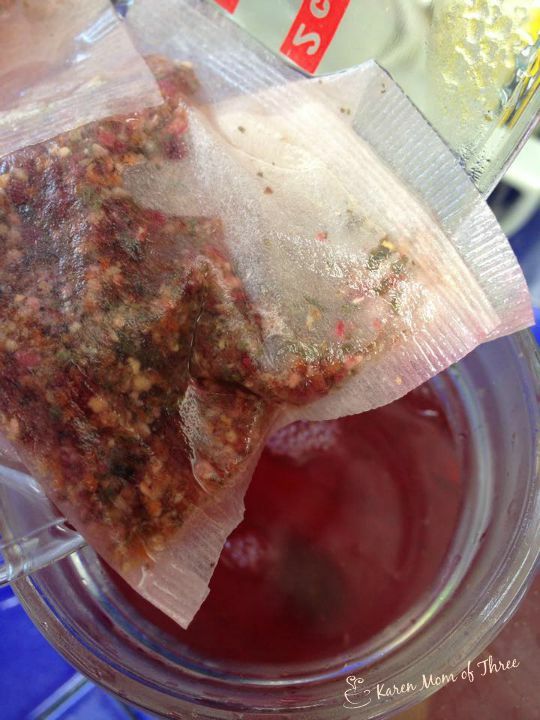 Step 4- Add your steeped tea infusion to your juice container. Stir to dissolve. Step 5- Add remaining water to you container and then allow your tea to come to room temperature and then place it in the fridge, or pour over a glass of ice and enjoy! 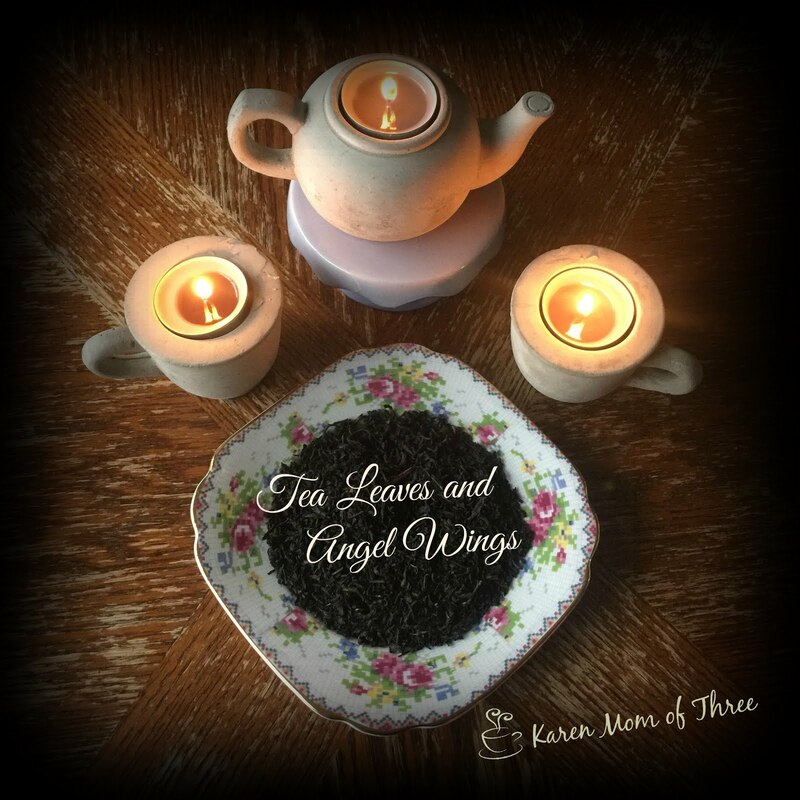 *The recipe inside the box for this tea is slightly different then mine so feel free to experiment with the strength of your tea! I hope you enjoy making and sharing this tea with our loved ones. Alex sure loves it and so do I! 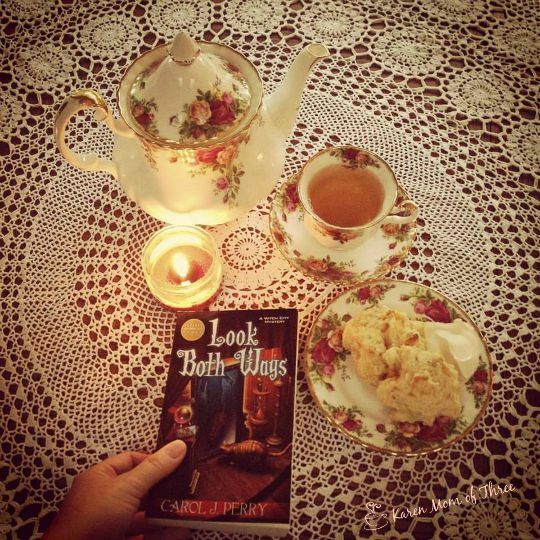 Thank you for joining me for A Cup of Iced Tea and A Cozy Mystery! Tails, You Loose By Carol J. Perry Is A Winner!